Living rooms are some of the most used and frequented rooms in your home – they are your social rooms, and as such loads of people will come into them over the course of the year, and they need be organised so that they are able to cope with everything. Having a sense of calm, clutter free living for GUESTS will make the whole room feel more comfortable and welcoming to them. So, to get your started, here are my top tips on organising living rooms – hope you enjoy! 1. What is the rooms purpose? Think about both the overall purpose of the room, and then what you want to do in that room. Don’t necessarily be guided by the “normal” uses for rooms – if you want a space for exercising, or for a hobby, then utilise your room as such. Maximise your space and make it work for you, after all, you are paying for every square inch! Don’t leave a room anywhere in your home unused if at all possible. 2. Does the room serve its purpose? Once you know what you want to do in each room – ensure that there is the space and necessary furniture/items in that space, otherwise it will just frustrate you by having to get up and down every time you need something. Basically you want to make every activity you do in the space as easy as possible to do. For example, if you read in the room – have a seat with a light close by (or by a window for natural light, and ensure you are seated so that the sun won’t get into your eyes as this will annoy very quickly! ), bookcases or a magazine rack to hand etc..
3. Double Function is best! Given my post of a week or so ago, I fully believe that one way of really maximising the organisation and storage in a room while minimising visual clutter is to have furniture that does more than one thing. For example, a storage footstool to hide away magazines and remotes.. find out more great ideas in the blog itself. Also – think about not only storage functionality, but extra functionality that may help your circumstances. Only have 2 bedrooms but need a third for frequent guests? Why not have a sofa bed in a living room so that you can easily convert that space to a bedroom when needed. Just think outside the box a little and you’ll be amazed at the results! Giving children a little independence works really well – and you will still be able to keep a watchful eye on whats going on if necessary! Its also important to give all members of the family some space as well – my husband and I decided to have 2 TVs in the house – one in each reception room. He is an avid football watcher, and I’m not (!) so when the season is in full swing, its easy to have separate evenings even if we both want to watch TV. It also means that the family room has a TV for my daughter to watch as and when as well. 5. Get the remotes under control! Remotes – seriously – how many do we all need! I have just been around my house and counted up – apparently we need 10! For stereos, TVs, DVD players etc… ARRRGGGHH!!! and you can be guaranteed that you won’t be able to find the right one when needed, or its in the wrong room, or has run out of batteries…. If you simply designate an area in the room for them, and get into the habit of returning them there after use (this works for any items in the room, and especially keys), then this will save you lots of time. I like using a drawer or a space within the TV unit itself, or inside a storage footstool. Just maintain where it is and you should be safe! 6. How many people need to use the room? It may seem a silly thing to ask, as you will want to answer “as many as there are living in the house of course!” – but stop and think for a moment. How many times do just the members of the house sit down together at any one time in the same room? Now – I’m not saying go out and buy as many chairs as possible just to be on the safe side – as you won’t need those 6 chairs every day and the room could look cluttered – but do you have access to chairs in another space that can be easily moved for the evening? Its just about thinking ahead and trying to ensure that you are prepared! As a minimum though, have enough for your family to sit down! We are trying to encourage this after all! 7. Is the furniture suitable? If you have a family, consider loose covered furniture and get two sets so that you can 1. change them over when spills happen and 2. get a new look easily. Think about special occasions when placing furniture i.e. where will your Christmas tree go? will it be easy or hard to fit in – try and make everything as easy as possible. And lastly – if a room doesn’t feel right, don’t be afraid to move furniture around – you may be surprised at what set up works best for you. When decorating, consider having neutral colours for the main items (walls, furniture, flooring) and add colour in soft furnishings and accessories – when you want a change it will be easier and cheaper to just change these things. Another great and very organised idea is having a summer set and a winter set (lighter curtains vs. lined thicker curtains for example) and swapping them over with the seasons. It gives a different feel to the room without breaking the bank. 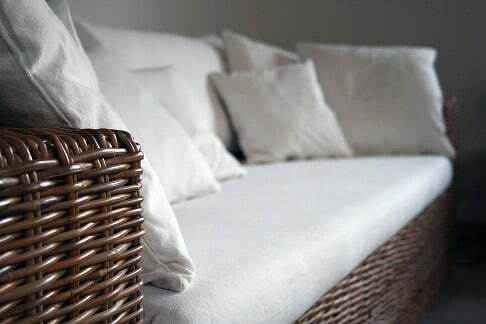 A basket can be used to hold remotes, videos or DVDs in a living room. A bin can be used to hold cards and board games which can be stored in a coffee table, shelving, end tables, or ottomans. Put the small pieces into plastic storage bags so they will not get lost. Have a sideboard style piece of furniture in each room and then you have drawers and a cupboard for all items in that space. IKEA do some great large wicker trunks/baskets that look good in the room but can hide a multitude of things! We will talk about this in future posts – but for now just ensure that you know what jobs are needed to keep the room looking good – and keep doing them! So, you should now have a better idea of what space you have, what you need to use the space for, and what can be done in each room. You will have decluttered and organised the items that you need in each room, and be on top of maintaining it as well. Well done! Let me know how it goes!